Sunday was the feast day of my patron saint, Charles Borromeo. The times in which he lived were not so different from the current ones, and leadership like his is sorely needed today. Although I am not a bishop as he was, I am a pastor. I pray that in some small way I may be like him. St. Charles Borromeo was born in 1538, a time when the Church was in the midst of perhaps her greatest crisis. Martin Luther had begun his revolt in 1522 with the publication of his 95 Theses. In the aftermath of the Protestant revolt, some 12 million Europeans (a very large number for those days) left the Church; more would follow in successive waves. The medieval Church was breaking up and suffering schism. Indeed, the whole medieval synthesis of Christendom was in turmoil, hopelessly intertwined with politics and intrigue both within the Church and outside. The clergy especially were in crisis and in tremendous need of reform. It was an era of absentee bishops and clergy. Wealthy European families collected parishes, monasteries, and other benefices more as a kind of stock portfolio than out of any spiritual love or interest. It was common that benefices were given to the sons in these families. Although ordained as priests, they seldom served as such, instead farming out the pastoral duties of their many parishes (and even dioceses) to other priests (often poorly trained ones). Knowledge of Latin, Scripture, and indeed the Lord Himself, was notably absent in many of these “clergy for hire.” Preaching was poor, the moral life of the clergy was degraded, and the faithful had little leadership. In this climate it is no wonder that Luther and other so-called reformers were so easily able to attract large numbers of the laity, who were not only poorly served but poorly catechized. The Council of Trent – Recognizing the criticality of the revolts (by Luther and others) and her own need for internal reform, the Church summoned the Council of Trent, which met sporadically between 1545 and 1563. Into this period of crisis for both Europe and the Church, St. Charles Borromeo was born. He was the third of six children in a noble family in Milan. His parents were pious and well known for their care of the poor. Their sober and religious demeanor goes a long way toward explaining the piety and appetite for reform that St. Charles would later develop. Reform starts at home. The wealthy and prominent Borromeo family was well woven into the difficulties and problems of the late medieval Church, owning many ecclesiastical benefices. At a very young age Charles Borromeo was given a large and wealthy Benedictine abbey by his uncle, Julius Caesar Borromeo. So, at the tender age of 12, Charles Borromeo found himself the abbot of a large monastery. His age and the fact that he was not even an ordained priest are representative of the serious abuses that were common at the time. Despite these impediments, St. Charles showed an inclination toward reform. He specified that the income he received from the abbey should be only enough to support his education, with the sizeable remainder given to the poor. Further, he promoted reform at the monastery by insisting on a return to a purer monastic environment. At the age of 16, he was sent to Pavia to study Canon Law. Although he found his studies difficult, he was noted for his piety, his refusal to indulge in the frivolities of university life, and his devotion to the rosary and private prayer. He even dismissed two of his tutors (both of them priests) because he considered them too secular, found them lax in saying their Office, and objected to the fact that they did not wear clerical attire. Papal Secretary of State at the age of 22! Just after Charles completed his studies, Pope Pius IV was elected. The new pope was Charles’ uncle, and as a gift to his nephew, he summoned him to Rome to become his Secretary of State. So, at the age of 22, although only a sub-deacon not a priest, Charles Borromeo became the Secretary of State at the Vatican and personal assistant to the pope and was named a cardinal deacon. It is a bit ironic that all this was technically a result of nepotism because Charles would become one of the leading proponents of Church reform. Perhaps his chief work (under the direction of Pope Pius IV) was to reconvene the Council of Trent, which had been suspended due to war. After many months of difficult negotiation and political intrigue, the Council reconvened in 1561. Charles Borromeo not only coordinated the activities of the Council sessions but also engaged in many delicate negotiations as the Pope’s personal representative. He had to work carefully to overcome the differences among certain delegates. The Council of Trent finally concluded in December of 1563, just prior to the death of Pope Pius IV. The importance of the Council of Trent cannot be overstated. Its decrees rejuvenated the huge and complex medieval Church and would serve as a guiding light for the next four centuries. Then, as now, the decrees of a council are not always welcomed, understood, or well applied. The work of Charles Borromeo was just beginning. St. Charles lost no time in applying the decrees of the Council wherever his authority extended. The next step for Cardinal Borromeo was to have a catechism written and published. He appointed three Dominican theologians to work under his supervision and the Catechism of the Council of Trent was completed within a year. He then ordered it translated into the vernacular in order that it be taught to the faithful by all pastors. Charles also set to work founding seminaries and colleges for the clergy, who were woefully undertrained. St. Charles was also involved in implementing liturgical norms and even took a hand at reforming the music, encouraging the development of sacred polyphony. It needed a guiding hand to ensure that it did not become too florid and that the sacred text did not become buried in musical flourish and performance. In this matter he worked closely with Palestrina. Time to get personal – Having used his position of influence in Rome to help implement the Council, he now petitioned Pope Pius V that he might implement it in his own life, for although the Pope had named him Cardinal Archbishop of Milan, he had been an absentee bishop, remaining in Rome as papal Secretary of State. Such absenteeism was common at the time, as already noted. In fact, it was rare in the larger cosmopolitan dioceses that the bishop would be present at all. These larger dioceses were usually benefices for rich families whose sons merely collected the income and did not actually serve in any pastoral capacity. Dioceses were usually administered by underlings. It does not take much to understand why abuses flourished under this system. With no actual resident bishop, no true shepherd in place, errors went unaddressed and corruption abounded. After some months of negotiation with the new pope, Pius V (who was resistant to the idea), St. Charles was finally permitted to take up residence in his diocese of Milan. He went with great eagerness to implement the reforms of the Council of Trent. He called several local councils of the Church there and set up seminaries for the training of clergy. Charles insisted that priests be present in, and minister to, their own parishes. He also established the Confraternity for Christian Doctrine (CCD) for the training of children in the faith, enrolling some 40,000 children in the first few years. He set about visiting every parish in his archdiocese, even the small ones up in the remote alpine regions. Not everyone appreciated the reforms Charles sought to institute. Some of the greatest resistance came from his own clergy and monks, one of whom pulled out a gun and shot him at Vespers (luckily, the bullet only grazed him)! Despite the resistance, St. Charles began many successful reforms in the Church at Milan. These reforms centered on the liturgy; the life, training, and discipline of the clergy; and the training of the laity in the ways of faith. 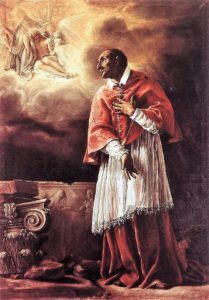 St. Charles Borromeo died at the age of 46, in the early hours of November 4, 1584. He had been on his way to visit a parish in the Alps and was stricken with a high fever. I have written more about him here: St Charles Borromeo. As can be seen, St. Charles lived during difficult times for the Church. Millions had left and corruption abounded in what remained. Many people would have despaired in the face of so many deep problems. Indeed, many would have wondered how the Church could ever recover from such losses in numbers and regain her capacity to preach the Gospel and reach the faithful. It goes without saying that the Church is crisis today. Millions have left the Church. Confusion among the faithful and the clergy abounds. Many of the faithful are poorly catechized. There have been grave moral, spiritual, and leadership issues among the clergy. Yet as the example of St. Charles shows, reformers can and do make a lasting difference. Changes for the better may come slowly, but they eventually do come. Pray for zealous pastors and reformers like St. Charles Borromeo. God still has His saints, His reformers, His St. Charles Borromeos. Many of them are already known to us and many more are yet to come. But come they will, for God will reform, establish, and cause to flourish the Church He so loves. As we all pray in these troubled time, Borromeo, Borromeo, where for art thou. This blog is such a blessing in my life, bringing much needed clarity to my thinking. You have followed in the footsteps of your patron saint very well. Thank you!